Hurricanes defeat Yellow Jackets in their first conference game of season. Duke Johnson #8 of the Miami Hurricanes runs with the ball against the Georgia Tech Yellow Jackets on October 5, 2013 at Sun Life Stadium in Miami Gardens, Florida. The Miami Hurricanes defeated the Georgia Tech Yellow Jackets 45-30 at Sun Life Stadium in their first conference game of the season. Stephen Morris threw for three touchdowns, Duke Johnson rushed for 184 yards and No. 14 Miami remained unbeaten after shaking off a problematic opening quarter to beat Georgia Tech 45-30 on Saturday. David Sims had two rushing touchdowns for Georgia Tech (3-2, 2-2), which wasted a 17-point lead against Miami last season and blew another double-digit advantage Saturday — plus missed a fourth-quarter extra point that would have tied the game. The Yellow Jackets led 17-7 after controlling the first quarter, then wound up losing to Miami for the fifth straight time. Crawford got his sixth rushing TD of the season midway through the fourth, then added an 18-yarder to seal the win for the Hurricanes, who dominated the second half and now get 12 days off before heading to North Carolina on Oct. 17. Hurns' 69-yard catch-and-run put Miami on top for good, on a play that had a high level of difficulty. Morris threw the ball from the sunny side of the field to the shadowed side. Hurns controlled it, beat one defender and took off down the left sideline, pulling up only while waiting for Dorsett to block Louis Young. Dorsett did his job, Hurns scored and the Hurricanes had their first lead. After Dorsett fumbled a punt away to open the fourth, Georgia Tech answered with Sims' second score of the game. But Trevor Stroebel's snap on the point-after attempt was low, Harrison Butker's kick went left, and Miami held a 24-23 lead. After that, it was all Miami, which overcame four turnovers for the second straight week and still scored plenty. The teams were tied at 17-all after an odd first half in which the Yellow Jackets held the ball for almost 22 minutes and were outgained anyway. The Yellow Jackets got 243 yards on 43 first-half plays, while Miami got 254 yards on only 19 plays. Sims' 7-yard run opened the scoring, marking the first time since the Virginia game last season — 47 calendar weeks ago — that Miami faced a deficit. It lasted a mere 32 seconds. 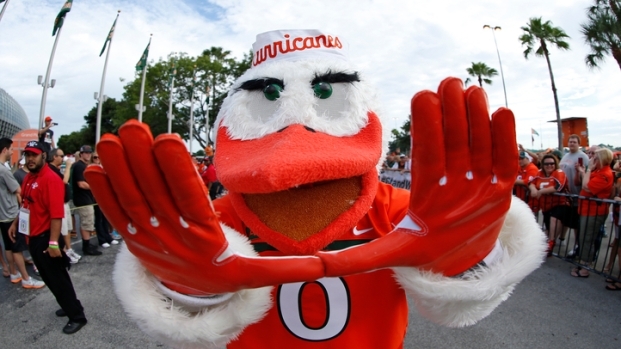 Johnson returned the ensuing kickoff to the Miami 27, ran 33 yards on the Hurricanes' first snap, and Morris found Dorsett for a 40-yard score on the very next play. 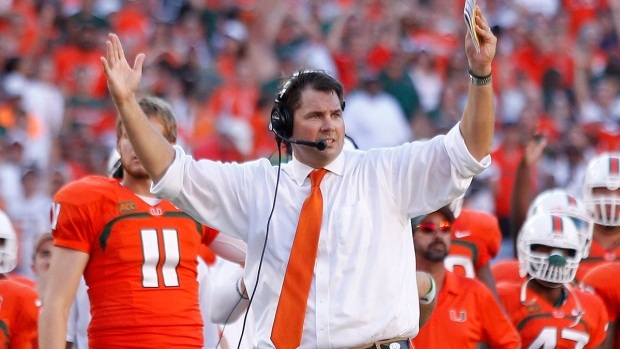 Two-play drives would be an early trend for Miami, and that wasn't necessarily a good thing. The Hurricanes' next two possessions were capped by second-play giveaways, with Johnson fumbling the ball away on one — leading to a touchdown that gave Georgia Tech a 17-7 lead on Charles Perkins' 31-yard run — and Morris having a pass intercepted on the final play of the opening quarter. Georgia Tech ran 25 first-quarter plays to Miami's six, and Hurricanes linebacker Denzel Perryman recorded 10 tackles before his team's offense took its seventh snap of the day. A winded Miami defense needed a break, and got it when Georgia Tech starting quarterback Vad Lee fumbled the ball away early in the second quarter. The Hurricanes capitalized when Morris connected with Walford on a 4-yard TD pass to get within 17-14. Miami tied it on Matt Goudis' 24-yard field goal just before halftime, starting a run where the Hurricanes would score 38 of the next 44 points. Stay with NBC6.com and NBC 6 South Florida for a full game recap.